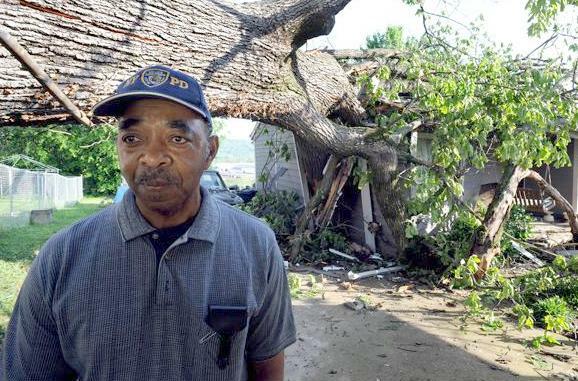 George Tate's home was hit by falling tree from storm in Knoxville, Tenn.
*Severe storms through the Midwest and Southern U.S. left at least 10 people dead on Tuesday and the region is bracing for a second set of storms. Faced with a desperate situation and more rain expected soon, the U.S. Army Corps of Engineers is considering a controversial plan, used only once before in 1920, that would flood more than 130,000 acres of Missouri farmland to save towns near the intersection of the Ohio and Mississippi rivers. The weather pattern varied throughout the region-with heavy rainfall in Missouri, tornadoes in Arkansas, and a severe drought in Texas. If the rains continue, meteorologists predict the Mississippi River will crest at more than 60 feet next month, surpassing the record 56.6 inches in 1927. Nine people were killed in Arkansas when a severe tornado burst through the town of Vilonia in the central part of the state, just north of Little Rock. Read/learn more at The Wall Street Journal.